About: There is definitely something childishly exciting about the glass lifts at the Heron Tower, home to Sushisamba and sister restaurant Duck & Waffle. The way the city drops away as we sweep swiftly skyward is astonishing. Once on the 38th floor the thrill continues with 360° views and a great outdoor terrace. Our table overlooked the east of the city with twinkly lights stretching out to the horizon and we spent a few minutes identifying landmarks and scoring points on our aerial knowledge of London’s cityscape. The restaurant is a large buzzy space with low, curved banquettes and an enormous orange installation hovering above which makes everyone look like they have spent too long at the (or possibly in) St Tropez. Staff are very cordial and knowledgeable and we were given a potted history of Japanese immigration into Peru and Brazil – Sushisamba is about the resulting Nikkei cuisine of the Japanese who settled in large numbers in Lima and São Paolo and incorporated traditional Japanese cooking with the ingredients and dishes of their new homeland. What We Ate: The menu is divided into Small Plates, Raw, the Robata grill, Samba rolls and Nigiri & Sashimi. We started with some Green Bean Tempura from the Aperitivos menu. The batter was crisp and it was a good, salty starter while we perused the menu, although the truffle in the black truffle aioli was only just discernible. Crispy Taquitos followed which were bursting with flavour – yellowtail marinated in lime and served with aji panca and miso infused with the flavour of roasted corn. Aji Panca features frequently on the menu and is a vibrant red paste made from a smoked, mild red pepper from Peru. Chillies gave the dish an extra kick. Wagyu Tataki was layered with a silky coat of foie gras and topped with a fried quail’s egg – a small but perfectly formed mouthful. The Chicharon de Calamar was a satisfyingly large mound of crispy fried rings of squid which had been tossed in a sticky coating of tamarind, lime and a zingy pico de gallo sauce. Crunchy, sweet and sour, I could eat this dish every day. Dishes from the Raw menu include slices of Yellowtail Sashimi Tiradito with a zesty sauce of jalapeno and lemongrass and Sashimi Seviche of Tuna with watermelon and tiger’s milk which was a little wan – lacking in the mouth puckering zing of limes and chilies. Chilean Sea Bass Anticuchos (let’s hope it was sustainably caught as there was no information available) came as two generously portioned skewers of exquisite fish anointed with miso and served with a drizzle of sweet dulce de leche on a bed on giant Peruvian corn. Poussin, also from the Robata grill came as a teriyaki, served with a delicious yuzu kosho mayonnaise. From the large plates we chose the Moqueca Mista and we were not disappointed. A large earthenware dish brimmed with seafood cooked in a rich coconut sauce, coloured with dende oil, a bright orange palm oil typical of Brazilian cooking. In a nod to neighbouring Argentina, the rice that completed the dish was mixed with chimichurri herbs and seasoning. And, crowning it was one enormous prawn. This was a lot of food but we did it justice and almost all of it was very good. And we still managed to make room for some sushi. The São Paolo Samba Roll, ordered in honour of my dining companion’s hometown, was complex and delicious. Perfect sushi rice encased scallop, masago, tuna, salmon yellowtail, avocado and sat up provocatively, dressed with hacho miso soy and chive oil and topped with a morsel of truffle. We weren’t done yet. Desserts here are worth the short lived discomfort of overeating. A bright mango mousse which came alongside a zingy kiwi-mojito sorbet and a lime and coriander sauce made for a refreshing end to the meal. With Love From Rio was rich and decadent, an intoxicating mix of valhrhona dark chocolate ganache, coffee mousse and a silky tonka bean ice cream. Organic Red Chocolate Chili Peppers featured a Peruvian chili mousse, which was sweet with a fiery kick, alongside a raspberry and red pepper sorbet and a bright red tuile. What We Drank: The wine list at Sushisamba is long and priced at the top end, as you would expect from a City restaurant of this calibre. And the cocktails make the most of the restaurant’s unique blend of Japanese and South American flavours. But the real winner, to my mind, is the extensive sake collection. One of the largest and best kept sake cellars (if sake is stored in a cellar, must find out one day) in London should not be missed, especially as it provides the perfect accompaniment to the food. Maurzio Palomba, the head sommelier, knows his sake and expertly paired our dishes. 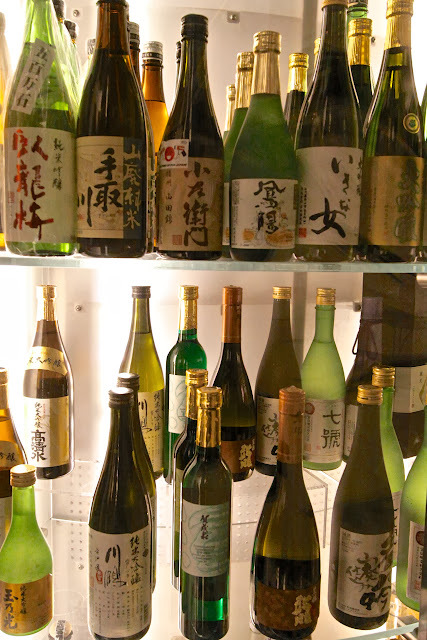 We chose to go by-the-glass and received a short and insightful introduction to each sake. A highlight was the Takara Mio Sparkling sake, which was bone dry and minerally, lifted by the effervescence. Kokuryu Black Dragon was complex and rich, while the Dassai 39 would make for a fabulous evening of sipping – although your wallet will not thank you for it. Likes: delicious Nikkei cooking, good service, fantastic range of sakes on offer, we thoroughly enjoyed the food and the London views from the 38th floor. Dislikes: it is a pity that bar was positioned where it is, it is seriously overcrowded and noisy and it detracts from the food experience at Sushisamba. Verdict: Sushisamba is more than just a fabulous view with a restaurant attached. Chef Claudio Cardoso’s kitchen delivers well executed dishes full of flavour and complex combinations - this is not to be confused with gimmicky fusion. The crowd is a mix of moneyed City workers and couples on a special night out. And the stonking view fills my heart with the joy of being a Londoner.